1. Petra. Best visit time is in the morning (less tourists), but in this case you will need to stay overnight. 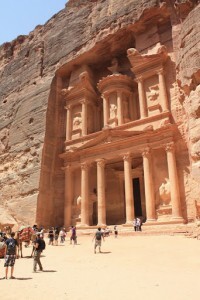 Is the most known touristic sight in Jordan (yes, it is the one you saw in Indiana Jones and the Last Crusade). Foreigners have to pay 50 JD (about 50 EUR). 2. Wadi Rum. Desert that you can visit on your way back from Petra to Amman. Impressive panoramic views are guarantied there. You will need to rent a jeep there or quadricycle. 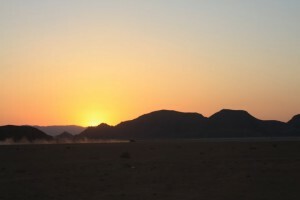 Wadi Rum. Impressive panoramic views are guarantied there. You will need to rent a jeep there or quadricycle. 3. Dead Sea. Try to swim there, take some pictures with you in water reading newspaper, pay 3 JD to get mud all over your body. Bring swimming glasses! There are many hotels next to Dead Sea all have various pricing options. 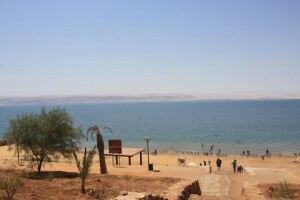 If you want to experience Dead Sea only try the public beach which is less expensive, but the sea is still there. Plan shopping for dead sea cosmetic products after. 4. 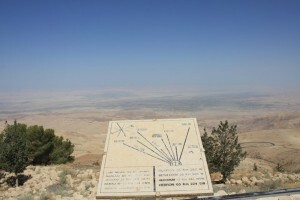 Mountain Nebo. Place where Moses looked over Promised Land. Not much to see there, but it is on the way from Amman to Dead Sea and because of local air and plants atmosphere and smells there are magnificent. Mountain Nebo. Place where Moses looked over Promised Land. 5. 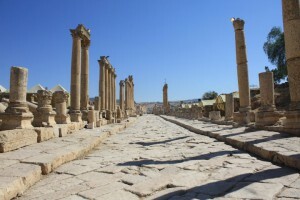 Jerash. Ancient Roman city. It is not what you see today in Rome. Good to see to get an idea how great Roman empire was. Jerash. Ancient Roman city. It is not what you see today in Rome. Good to see to get an idea how great Roman empire was. 6. 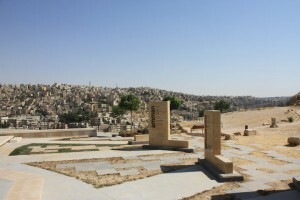 Amman. Not really a touristic city, but visiting citadel and shopping in downtown is a good way to spend few hours. Visiting citadel and shopping in Amman’s downtown is a good way to spend few hours. Restaurant in Amman: Rajeen – www.rajeen-jo.com – First Circle – Al Rainbow st.